Here is a splendid combination of history, architecture, music, art and native cuisines for a delightful vacation in the heart of Eastern Europe. 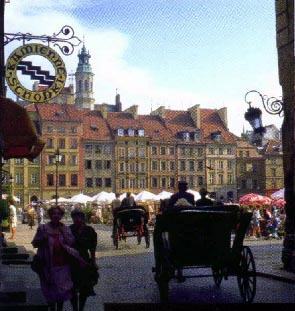 Take an unforgettable and timely journey by private motorcoach through Poland. Observe first hand the historical and cultural heritage together with the exciting and challenging winds of change occurring in the heart of old Europe. Day 1: WASHINGTON/ZURICH. Departure from Dulles Airport with Swiss Air at 6:10 PM, Dinner and breakfast on board. Day 2: ZURICH/WARSAW. Arrive Zurich at 8:25 A.M. Connection with Swiss Air at 10:05 A.M.; Arrive Warsaw at 11:55 PM. Private coach transfer to the excellent Victoria Hotel in the center of Warsaw. This hotel is well located and features numerous fine restaurants. Remainder of the day at leisure to relax from the flight. Welcome to Poland dinner at the Hotel's Canaletto Restaurant. Day 3: WARSAW. This morning an orientation tour of Warsaw, Poland's heroic capital. The city has been completely reconstructed since World War II. The "Old Town," dating from the 14th Century, was rebuilt with much of the old stone; its atmosphere recalling the city's ancient history. Luncheon at Wilanow Palace, former residence of King Sobieski. After lunch visit to Lazienki Palace, private residence of Polish King. Outstanding example of neo-classical architecture. Numerous beautifully decorated rooms and a picture gallery with the King's Art collection. The Palace is surrounded by Lazienki Park with bridges, summer-houses and statues. This evening folklore show with dinner. Day 4: WARSAW. A full-day excursion to Zelazowa Wola, Frederic Chopin's Birthplace, to attend a Chopin piano recital. This Manor House stands in a lovely park and houses a museum dedicated to the composer. Luncheon at a typical Polish Country Inn. Before returning to Warsaw, visit Nieborow, a baroque palace originally built for the Cardinal Archbishop of Lowicz. Subsequently it belonged to various families including the Radziwills. Especially noteworthy are the exquisite park and a fine collection of Objects D'Art. Dinner in Jablonna Palace, former residence of the Prince Poniatowski Family. Day 5: POZNAN. This morning depart for Poznan via Gniezno, Poland's first capital and one of the country's oldest cities. Luncheon at a local inn, and a visit to famous Gniezno Cathedral. Afternoon arrival in Poulan with accommodations at the Poznan Hotel. 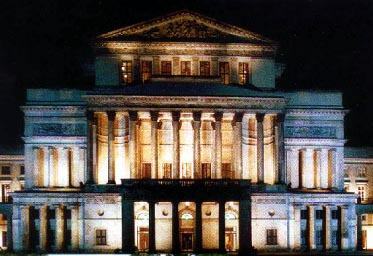 Poznan is Western Poland's most important cultural center, with a philharmonic orchestra, an opera company, several theaters, the famous choirs under Stefan Stulingrosz and Jerzy Kurczewski, Konrad Drzewiecki's Ballet Ensemble, and the Wielkopolska Folk Song and Dance Ensemble. Tonight's performance will feature one of these, depending on schedules. Day 6: POZNAN. Morning sightseeing of Poznan, to include the "old town" with its market square surrounded by period mansions, the town hall, one of the most beautiful Renaissance structures in Central Europe, the 10th Century Cathedral, Raczynski Library, site of the international trade fare, and the Opera House. Afternoon free for shopping and exploring on your own. This evening ride into the countryside in horse-drawn carriages for a traditional picnic with Polish specialties and attend a Bonfire Folk Ensemble performance. Visit to Czarniejowo Palace. Day 7: POZNAN-CRACOW. Departure by private motorcoach for Cracow. 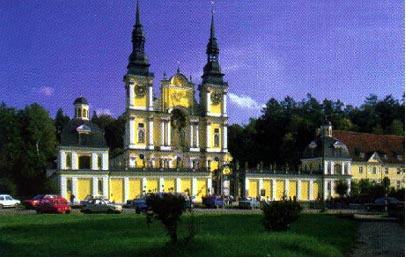 Stop at Czestochowa to visit Poland's holiest shrine, the Black Madonna, in the Pauline Monastery of Jasna Gora. This painting has been the object of veneration for centuries and is attributed by legend to St. Luke. Luncheon at a local typical inn. Accommodations at the deluxe Forum Hotel on the Vistula River, overlooking the Wawel Castle. Dinner at the hotel. Day 8: CRACOW. Morning sightseeing in Cracow to include the main market square, Wawel Castle and Cathedral. In the industrial suburb of Nowa Huta, visit the ultra-modern, ark-shaped church of the Queen of Poland, closely associated with the solidarity movement. Luncheon at Wierzynek, a leading restaurant, where the King of Poland entertained a score of princes in 1364. After lunch continue sightseeing in Old Town, to include the Gothic Church of the Virgin Mary, the Chartolyski Collection including works by Da Vinci and Rembrandt and the Collegium Maius where Copernicus studied. Free evening. Day 9: CRACOW- ZAKOPANE. After breakfast a full-day excursion to the year-round resort of Zakopane, where the picturesque traditional life of the inhabitants, their costumes and crafts, may be seen at every turn. Drive through the majestic Tatra Mountains. Lunch at the Hotel Kasprowy. Farewell to Poland dinner at a local restaurant. 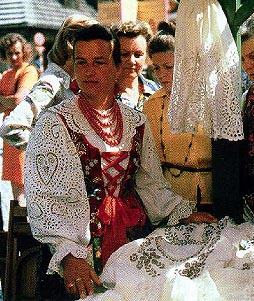 Polish specialties will be featured. Day 10: WARSAW-ZURICH-WASHINGTON. After breakfast we transfer to the airport, where we board our Swiss Air homeward bound flight to Washington. Depart Warsaw 7:10 A.M.; Arrive Zurich 9:00 A.M.; Depart Zurich 12:05 P.M.; Arrive Washington Dulles 3:30 P.M. 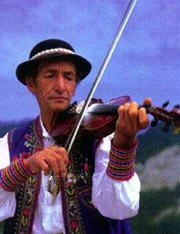 This fall we are also proud to offer a Music Tour of Poland.